Actually I've been taking pictures with a simple digicam for lots of years before I started to take a closer look at photography in 2010. It's been nothing but the amazing 365 projects of some flickr members that cast a spell over me and made me want to try this on my own what turned out to be the beginning of a true love affair. There are lots of amazing photographers that I admire such as Aela Labbé, Alison Scarpulla, Mariam Sitchinava, Laura Makabresku, Brandon Long, Heiner Luepke, Davis Ayer or Neal Krug but I guess I'm mostly influenced by what surrounds me. May it be a person, a thing, a mood, a song or whatever. I've been mostly doing self portraiture so far but a mix of fashion and unique portrait photography would be great! This is quite different. Some of my pictures seem to happen completely spontaneous without lots of preparation, others have been planed for a long time. I have a small book where I write down all ideas that cross my mind so that I don't forget about them but the most important thing for me is to feel that it's the right time to realize a certain idea so that the emotion I'm trying to express really becomes visible. Once I have an idea the process from taking the picture to editing it is more or less the same. I currently shoot with a Canon EOS 450d, Canon 18-55mm 3.5, Canon 50mm 2.8 or Canon 50mm 1.4. When it comes to polaroids I use a Polaroid Image System Camera. For the editing I use Photoshop CS6. I hope to make a living out of photography one day. It would be a dream to shoot fashion editorials and to team up with other artists may they be up and coming. I think it's the fact that photography somehow is the unseen becoming visible. It captures a moment, awakes an emotion and helps us to remember. It mainly depends on on the concept behind but I can say that I prefer models with a natural beauty and some kind of imperfection. Beauty and interestingness isn't about symmetry, black or blond hair, green or blue eyes…it's about personality. As said before I'm madly in love with the works of Aela Labbé, Alison Scarpulla, Mariam Sitchinava, Laura Makabresku, Brandon Long, Heiner Luepke, Davis Ayer or Neal Krug for example. I guess it's way more about sensitivity than about an outstanding idea. You have to feel what you want to express and you need to be able to show an interest in the subject you want to photograph. I adore the colors, the light and the overall atmosphere. Even though one can almost feel the wind blowing through her hair everything seems wonderfully calm, tender, sensitive and dreamy. Obviously not a very spectacular photo but from the pictures that I've taken during this year it probably represents the direction I want to got to and the way I want my pictures to look like the best. I have a predilection for the vintage look and the kind of mystical but yet enchanting atmosphere. What I also like about this picture is that you can see both strength and fragility in it. In case of publications it might be the fact that one of my pictures has been chosen as the Photo Of The Day by the editors from Italian Photo Vogue. The biggest personal achievement is to know that I'm able to touch people's hearts with what I create. Wether this means to be original or not, I think it's much more important to follow your heart and to be authentic than to hunt the most outstanding and innovative idea. It's impossible to constantly come up with something that hasn't been there before. What helps me personally not to get stuck in a creative rut and to keep on improving myself is to reflect my work from time to time. What do I like about it? What could be different? Is it what I'm trying to achieve? How could this or that become even more intense? Am I starting to copy my own ideas? Do I have to leave my comfort zone and try something new or do I have to go back to the roots? Vikky Ivie. 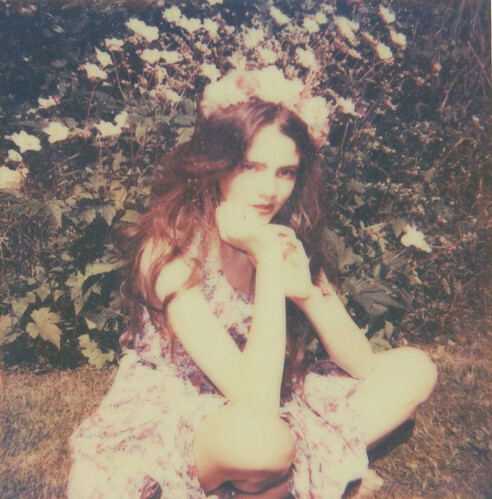 I stumbled across her work on flickr only a few weeks ago and I'm absolutely impressed by her polaroids! 17. Do you often change a lot of the original photo in Photoshop? I'm not really used to photoshop manipulations but of course I'm working with adjustment curves to achieve a certain look for my pictures. 18. Do you think you have an original style that is you own? Yes, I'd say there are some elements in my pictures (color scheme, body language, mood) that make my own style. 19. Do you prefer studio or location? Location, definitely. I haven't been shooting in a studio so far. 20. If you could photograph any person alive or dead who would it be and why? As sometimes I get mistaken for Florence Welch from Florence and The Machine and people tell me that my pictures remind them of her I'd absolutely love to make her the subject of one of my photographs. I'm a fan of her music and style too and I guess the way she acts would match my work just great. 21. Can you tell us how you achieve your muted and dusty tones that your beautiful images posses? There's not much of a secret behind. It's just some color correction in photoshop. 22. Give us the skinny, what's the next project you've got coming up? At the moment I'm planning on a few wonderful shoots with other people in front of the camera but everything's still in process and it's a bit too early to tell much about it. I hope I'll be able to announce detailed information and to share the first results in about a few weeks. 23. Which actor would play you in the film of your life? Alexandra Maria Lara or Drew Barrymore, maybe. 24. What did you want to grow up to be when you were a kid? I've always had a strong affinity for any kind of creative expression but honestly I don't remember an exact career aspiration. Thank you so much Marina, I found from doing the interview with you I fell deeper in love with your work, so so beautiful!! !